After reading all the rave reviews, you’ve finally decided to buy an air fryer for home use. Well, before clicking the ‘best price’ button, let’s go through this final quick guide to make sure that you’re buying the best air fryer for your needs and budget. The first air fryers to hit the market were the Tefal and Philips brand. Since then, popularity has surged due to feedback about its ease-of-use and healthy oil-free cooking features. Now, you have many brands to choose from. Air fryers come with a metal heating element or halogen lamp and a fan. The multi-cooker air fryer has this amazing ability to act as a fryer, griller or a small capacity convention oven, cooking food in a tasty, fast, healthy and simple way. Most come with a temperature control range of between 175 – 400°F. Depending on the model, the healthy home air fryer comes with a built-in 30 minute or 60 minute countdown timer. The basic package will include the air fryer body and a removable non-stick mesh metal frying basket. Some brands have their own air fryer accessories such as the wire rack, baking tray, rotisserie fork etc. Air fryers come in family sizes (about 4 – 6 person) and compact sizes meant for 1 or 2 person. For example, the compact size Philips air fryer comes with a 1.8lb cooking capacity basket. The Philips XL large capacity family size airfryer comes with a 2.65lb cooking capacity and can easily feed 4 people. Large capacity air fryers such as the Avalon Bay XL or the Power XL 5.3-qt digital air fryer can easily cook a 6 lb chicken, 4 – 5 chicken breasts or 6 pieces of chicken drumsticks. Air fryer with rotisserie feature comes with even larger capacity to fit in the rotisserie fork or baking cage. Gourmia GTA 1500 turbo air fryer with its 10.5 qt capacity comes with a rotating baking cage, rotisserie fork, tongs and wire rack. Turbo air fryers with rotisserie feature are usually heated using a halogen bulb. The rotating baking cage eliminates the need to shake the food halfway during cooking. Let’s check out the 1.8 lb capacity hot air fryer. So, how much food can you actually cook in the compact size 1.8lb cooking capacity air fryer? It will depend on the types of food ingredients you’re using. 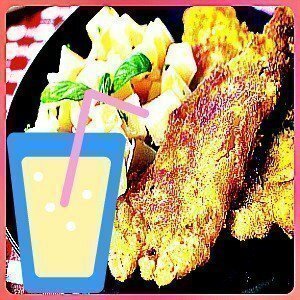 You can easily do 800g/28.2 oz of home-made French fries or 700g/24.7 oz of the frozen ones. However, less is faster and you get more even cooking. A basket of between 200 – 800g of frozen fries will take about 11 – 25 minutes. As for small snacks, you can cook 500g/17.6 oz of these at the same time. Only 1 layer of larger size snacks, poultry or meat is recommended, space them out on the bottom of the basket. On top of that, make sure that there is some spacing between the ingredients. This is to allow for hot moving air to circulate easily around the food items. For food to cook well, there must be good airflow around the food ingredients in the cooking chamber. As for baking bread, muffins etc, a baking tray measuring 6″ in diameter would be fine. However, make sure the dough doesn’t fill past the half-way mark as it will rise during baking. Judging from the many feedback and reviews from customers found online, it is a better option to get the larger capacity air fryer even if you’re cooking for only 1 or 2 person. This is because you might still end up cooking in batches for the larger food items. If you love a whole roasted chicken cooked rotisserie style, then you’ll need the larger capacity air fryer with rotisserie feature. You can’t really fit a whole chicken in the small capacity ones. Besides, with a larger food capacity machine, you can cook different food ingredients for 1 person at the same time instead of separating into 2 rounds, 1 round for each ingredient. For example, the larger size basket has enough space to cook your fish and chips at the same time as opposed to cooking the fish and chips separately in the smaller size basket. Are you looking for the latest digital air fryer with touchscreen and smart preset buttons or an analog air fryer with manual push buttons or dial knobs? As for the fryer with smart preset buttons, you can save the settings for your favorite recipes and it’s just an automatic press for future cooking. It is indeed simple, convenient and fast. You can customize the settings to your own preference with its timer and adjustable temperature controls as a lot will depend on the size of your food ingredients. A fryer that comes with a higher wattage will cook faster compared to the one with lower wattage. The air fryer comes with 2 adjustable controls – temperature and timer control. These are simple to use and adjust. You do not have to figure out a lot of complex options to arrive at your delectable results. With such a versatile easy-to-use cooking appliance that fries without oil or just a tablespoonful, healthy frying is possible in the home kitchen. It is indeed a good alternative to deep frying. Air frying is also a good alternative to preheating the convection oven that comes with longer cooking times. 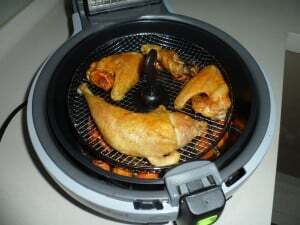 The air fryer for home use has indeed make cooking a pleasure for me. The air fryer provides countless cooking possibilities. It is a fulfilling activity with delightful results for my loved ones. How about you? 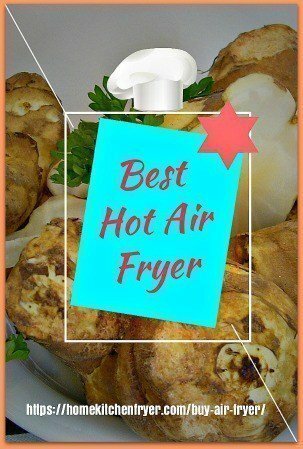 Have you decided to buy an air fryer for your cooking needs? Oh, by the way, the greaseless healthy air fryers make wonderful gifts for all occasions! Here’s a more detailed article on the best air fryer to buy.